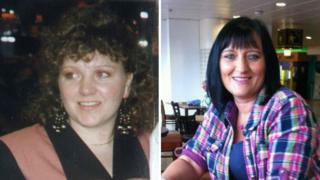 A man believes his wife would still be alive if the probation service had acted on warnings and sent a convicted murderer back to prison.Simon Mellors, from Nottingham, murdered his former partner Pearl Black in 1999, then killed Janet Scott after being released from prison on licence.Her husband, Chris Scott, said Mellors threatened to kill them both and followed Janet to work before she died.The Ministry of Justice said a full review into the case is under way. "If the probation service had done something and informed the police and had Mellors arrested my wife would still be alive," said Mr Scott. Mellors was released from prison in 2014.He was in a relationship with Mrs Scott while she was temporarily separated from her husband in 2017, and killed her after she got back together with Mr Scott.Mellors stabbed her at her home in Nursery Road, Arnold, Nottinghamshire, on 29 January then drove her towards Nottingham city centre. She escaped and ran towards a traffic officer for help, but Mellors drove his car into both of them, injuring the traffic officer and killing Mrs Scott instantly.Mellors died in prison after being charged with her murder and the attempted murder of the traffic officer. He is thought to have killed himself. Mr Scott said his wife knew Mellors was going to kill her. "She knew it was coming," he said. "I said 'Look, you've got nothing to worry about, I'm here, I'm going to protect you, nothing is going to happen'. ""This has hit me so hard it has just ripped my life apart." Pearl Black's brother and sister, George and Mary Black, wrote to the Parole Board before Mellors was released from prison, to warn them that he would kill again.Ms Black said: "The Parole Board have let us down totally. The justice system has let us down by not listening to us when we warned them this man would commit murder again." Mr Black said: "Two good women died by the hands of this monster. "The different agencies should have picked up on this because he had been stalking Janet. "The families of both murdered woman are supporting each other and want the justice system held to account over Mrs Scott's death.They have started a petition for a register so that people can find out whether someone is a convicted murderer before getting into a relationship with them. Janet and her older sister, Susan Thomson, were at a pub in Nottingham just before Easter 2017 when she met Mellors.Mrs Thomson said Mellors did not tell her sister about the murder conviction for at least six to eight weeks. "If she had knew this she would never have got involved with him," said Mrs Thomson. "She was just a very caring person and she always said to me everybody deserves a second chance in life. "Janet's brother-in-law Keith Thomson, who knew her since she was 10 years old, said she had already "formed an attachment" to Mellors by the time she found out about his murder conviction.The Thomsons said Janet tried to end the relationship several times but Mellors would not accept it.They said that Janet complained to Mellors' probation officer about his behaviour. "I knew that my sister sent texts to the probation officer because she rung me up when she did it and told me so," said Mrs Thomson. "I feel that Simon should have been told, or pulled in, or something done about it, while he was stalking my sister." Why was Mellors originally jailed? Mellors murdered 36-year-old Pearl Black, on 6 May 1999 at her home in Ewe Lamb Lane, Bramcote, Nottinghamshire.He battered her head repeatedly with an iron bar then strangled her with cable ties.Mellors denied murder, claiming diminished responsibility because he was depressed at the time, but the jury rejected this and convicted him.He was given a life sentence with a minimum of 14 years to be served in prison, but Mellors appealed his sentence and had it reduced to 12 years.He was released on licence after the Parole Board deemed it was safe to do so.The Parole Board said in a statement: "The Parole Board directed the release of Simon Mellors following an Oral Hearing on 28 February 2014. We cannot comment on the specifics of the case." Why was Mellors not sent back to prison? When someone serving a life sentence is released on licence they can be recalled to prison at any time if they are considered to be a risk to the public.Mr Scott said his wife raised concerns about Mellors with his probation officer numerous times, and even had the officer's phone number stored in her phone.Her concerns included a threat made by Mellors shortly before Christmas 2017. "Mellors told Janet 'I'm going to kill Chris and then I'm going to kill you, because if I can't have you nobody can have you'," said Mr Scott.He said Mellors approached his wife and "pestered" her on her way to work at Lidl on 25 January - four days before she died - then returned to the store later that morning. "Janet did text me and say that she reported it to the probation service," said Mr Scott. "As far as I was concerned that was a breath of relief and I would have thought they had done the right thing and contacted the police and had Mellors taken off the street." Will anyone be held to account? Both families blame the original judge for not giving Mellors a longer sentence, the Parole Board for releasing him, and the probation service for not sending him back to prison.An inquiry known as a Serious Further Offence review is being carried out which will examine the probation service.A Ministry of Justice spokesperson said: "This is a tragic case and our sincere condolences are with the victim's family and friends. "Serious further offences such as this are very rare, but each one is taken extremely seriously and investigated fully. "A full review into this case is under way, and we will carefully consider the findings to make sure all possible lessons are learnt. "An inquest to examine the circumstances of Mrs Scott's death has also been opened and adjourned.